Bought this laptop from Amazon. I am in love with this laptop. 1. 15.6" Full HD (1920 x 1080) widescreen IPS display is just amazing. 2. It doesn&apos;t slow up while playing games. 1. Resilience casing is very weak. 2. It is expensive comparative to other brands. 2 Pricebaba users have written their experience with Acer Predator Helios 300 (NH.Q2CSI.003) (i7 7th Gen/8GB/1TB/128GB SSD/Win 10/4GB GFX). If you own Acer Predator Helios 300 (NH.Q2CSI.003) (i7 7th Gen/8GB/1TB/128GB SSD/Win 10/4GB GFX), please do leave your feedback too. 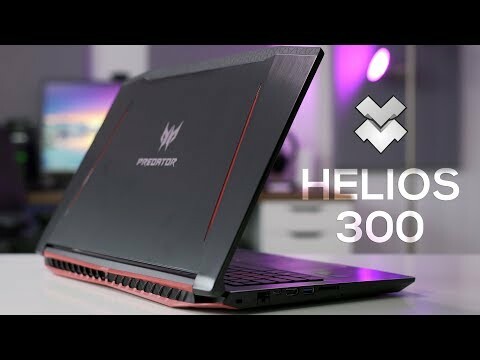 The Acer Predator Helios 300 is a powerful gaming laptop. Let’s take a detailed look at what this laptop delivers. The Predator Helios 300 boasts of a 15.6-inch screen with Full HD resolution of 1920 x 1080 pixels. For video calling utilities, there is a webcam just on the top of the screen. The device comes with built-in dual speakers that produce decent quality audio. There’s a headphone + microphone combo jack for connecting audio equipments. The Predator Helios 300 packs a hardware firepower. It houses an Intel Core i7 (7th gen) chipset ticking at 2.8GHz. The processor is coupled with 8GB DDR4 RAM which can be expandable up to 32GB for seamless multi-tasking. For graphical functions like gaming & editing purposes, the Helios 300 is equipped with NVIDIA GeForce GTX 1050Ti processor along with 4GB GDDR5 Graphics Memory onboard. In terms of storage, Acer has installed a hybrid drive with 1TB storage in the form of Hard Drive & 128GB in SSD. The device ships with Windows 10 operating system out of the box. The Predator Helios 300 is powered by a 3220 mAh removable battery. On a full charge, it can last up to 9 hours. The Predator has plenty of ports. There are two USB 2.0 ports and one USB 3.0 port. A HDMI port enables the user to connect the laptop to big screen devices like TV. In case the WiFi stops working, there is an ethernet port for connecting to the internet. The laptop features a USB Type-C port for fast data syncing & charging. SD & SDXC memory cards are compatible with this laptop. Connectivity options also include Bluetooth v4.0 & WiFi. In terms of dimensions, the Predator Helios 300 carries a weight of 2.7 kg. The laptop comes with 1 year onsite & international travelers warranty.